Registration starts at 9am. All registrations include lunch! Any registered rider that raises $100 plus will receive a free t-shirt. Passport Pit-Stop (like a poker run) chances will be available to purchase for an additional $5. You will receive a card that you will have stamped at our Pit-Stops and brought back to our registration table for the drawing for a 2 night stay at the Clarion Resort in Ocean City, Maryland, courtesy of the Clarion. 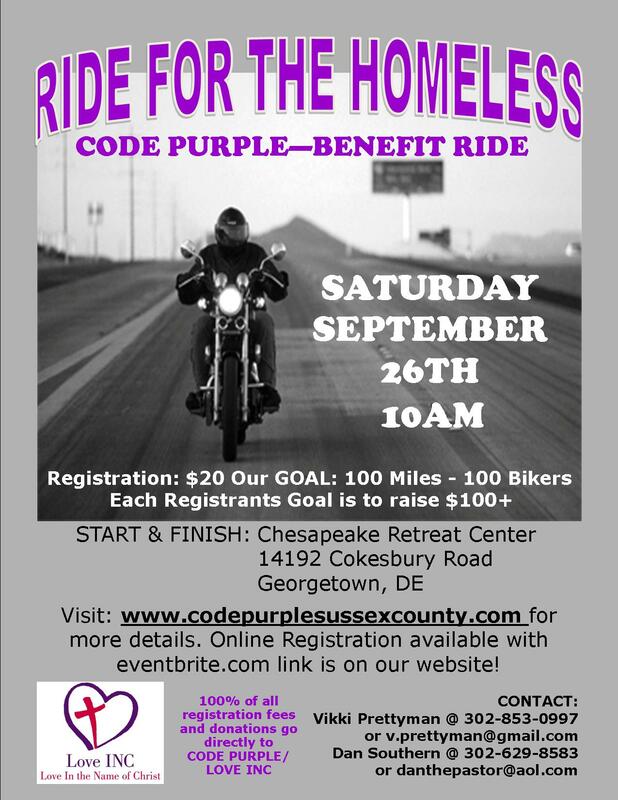 Also, the rider with the most funds raised will receive a 2 night stay at the Dunes Hotel in Ocean City, Maryland, courtesy of Why Not Travel. There will be other door prizes to win! 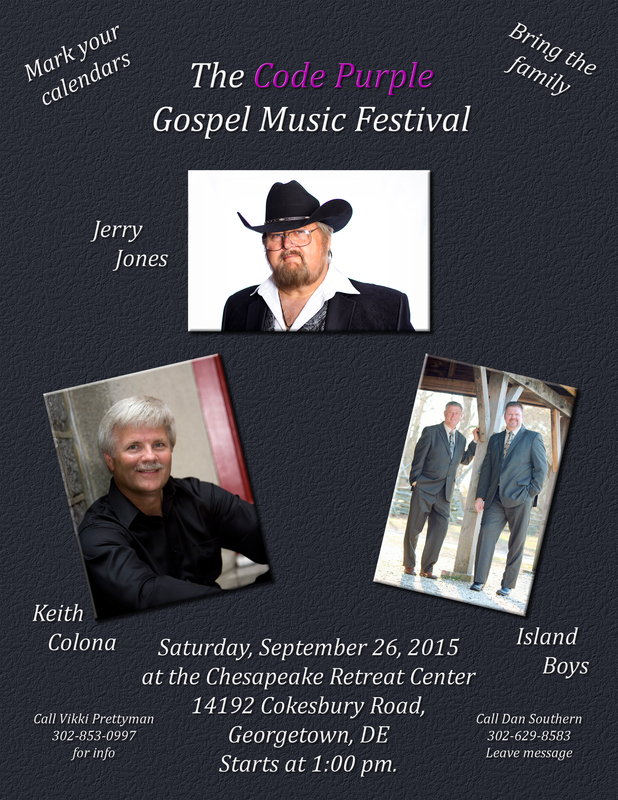 Gospel Festival starts at 1pm and will feature Jerry Jones, Keith Colona, and the Island Boys. Bring your lawn chairs. The concert is free but we will be passing around a love offering bucket. See our Events & Fundraiser page for more information and registration forms! We are collecting sunblock, bug spray, water, foods that are individually wrapped (ex. poptarts, soft breakfast bars, fruit cups, crackers), pop top canned foods, any easy “to-go” foods that do not need cooking. 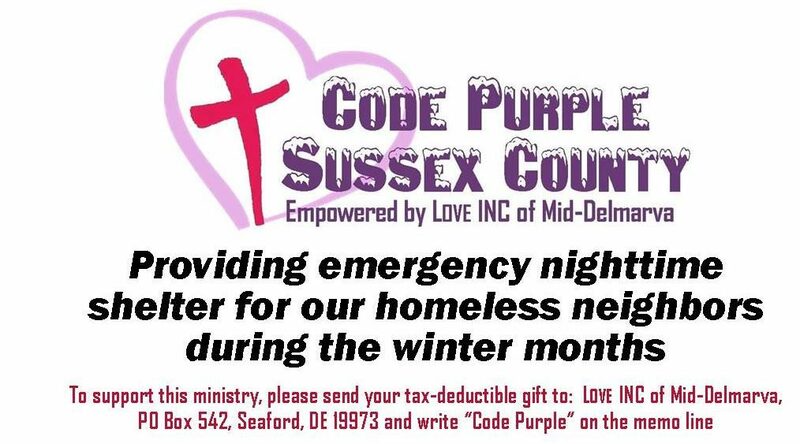 If you can help donate please email sussexcountycodepurple@gmail.com to arrange pick up or delivery drop off location.